In previous entries the issue of stiff fissured clays and the time to failure was briefly touched. The design of such slopes is not a trivial matter and requires significant knowledge of soil mechanics, geology, hydrogeology etc. One additional issue mentioned (one that sometimes is neglected) is the scale effect. This was presented in the previous entry for a very deep mine in rock. This issue of scale effect in relation to stress field will be briefly presented for the case of stiff fissured clays and hard soils. In the following picture a large highway cut of about 30m is shown. For a civil engineering project this is a significantly high cut. The effective stress filed in this cut can range from of 50 – 500kPa which is the normal range for laboratory testing. 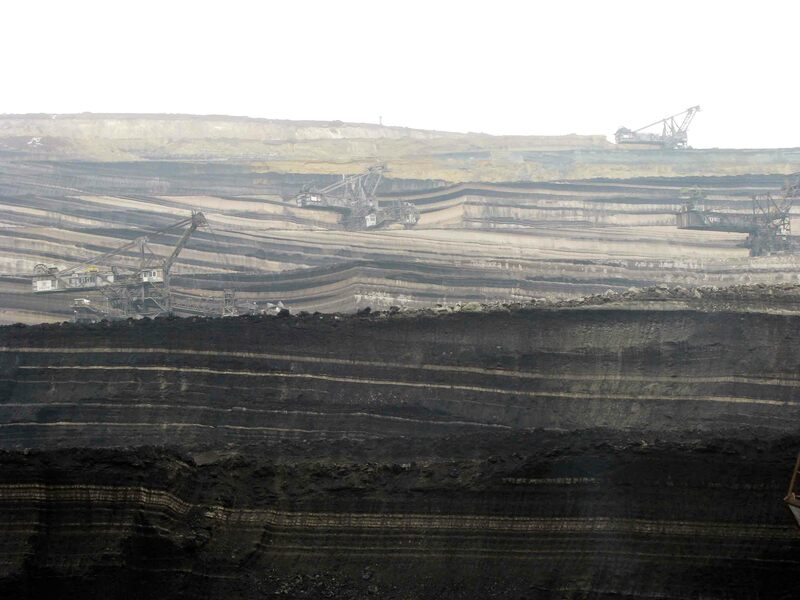 In the second picture a large excavation for a lignite mine is presented. The depth of excavation of this multi bench cut is around 135m. The excavation of this type needs to consider bench stability of slopes with heights of around 18m and also overall slope stability for highs above 135m. In the second case a large part of a possible failure surface could be in a stress field of around 1500-2000kPa or even more. In the following figure the two types of cuts are compared and one can easily understand the significance of scale effects in the design of the different cuts. The scale of the mine excavation is such that even in one cross section, one has to consider besides the stress field, differing geology (pic 4), presence of faults, ground water locations and pore pressures etc. We will focus on the stress dependency at this point. According to Stark et al, (2005) both fully softened and residual failure envelopes are stress dependent. In this work Stark et al provides an empirical graph regarding the stress dependency until 700kPa of normal stress for residual friction angle and 400kPa for fully softened friction angle. Shear strength information for higher effective stresses >1MPa are not readily available. Furthermore execution of such tests in very high effective loads is not easy for most commercial laboratories. It may even be very difficult to execute ring shear tests in very high loads due to sample thickness and squeezing out from the sides. In such high slopes the failure surface can pass from a number of soil layers with different shear strength properties. It is not easy to evaluate the “average” shear strength of layers involved in a possible failure surface. Unfortunately a rule of thumb for selecting shear strength parameters for such slopes cannot be provided. Engineering judgment is required in selecting such parameters and the stress conditions must not be ignored. Shear strength tests should be evaluated in relation to the expected stress field. Due to some reasons i cannot see the pictures except last two . Thank you for your observation, our team is working to resolve this issue which is found in some type of browsers like safari. If you press on the picture even if you don’t see it in the page it will come up and will show correctly.